Welcome to our wonderful farm here in the rolling hills of the Missouri Ozarks. Adding the Bernese Mountain Dog to it made it all the more wonderful. These wonderful companions have been a part of our lives for over fifteen years. Our 15 acres is where our dogs get there daily exercise. Lots of space makes for a healthy dog. Our oldest Berner female is 8 years old and still healthy. She is past the age for having puppies, but will continue to roam this farm for the rest of her life. 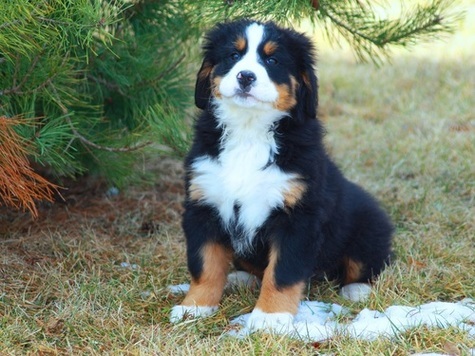 The Bernese Mountain Dog Puppy is becoming very popular in the United States in the last couple years and many people have fallen in love with it. The Bernese Mountain Dog is a very friendly dog and is very good with kids. If well taken care of will live to 10-12 years of age. Switzerland is the origin of the Bernese Mountain Dog and it is getting widely popular in America. The Bernese Mountain Dog Puppy is very fluffy and cute at an early age than will become more gangling at about a year old. The Berner is almost fully grown at two years. We raise the Bernese Mountain Dog Puppy to be healthy, well-socialized, well-bred dogs for companion animals is our goal. We welcome visitors to stop by and see our newest babies or call us at (573) 378-6688 for questions. Check out our available puppies on this page. We require a $200 non-refundable deposit on the puppy. The remaining balance for the puppy will be paid at pickup or before delivery. If you would rather pay after delivery we offer a program through Wags Lending. From day one our berner puppies receive lots of socialization and TLC from our children. All puppies have declaws removed, vet checks, current shots, and deworming. AKC registered with papers is provided with each puppy. The parents are OFA certified with good ratings. Each puppy comes with a registered microchip. We feed a gel probiotics to our week old puppies powder probiotics on the weaned puppies till the day they leave for their new homes and recommend strongly to continue using a good probiotic till the puppy is a year old, it will help bult up the puppies immunity system, probiotics make for a very healthy digestive system which makes for a healthy puppy. The Bernese Mountain Dog is often recommend to be fed a good quality feed to help with bone development and strong joints. We have some nutrients we recommend for the Bernese Mountain Dog or other large breed dogs. One year health guarantee for puppy against any genetic diseases. Replacement it with an equal quality berner puppy. We recommend Health Insurance from Nationwide which can be obtained $24.99 a month. We offer air shipping here in the United States which makes for a short time in transport. Our normal shipping rate is $320. Air shipping is very quick and economical way of getting your pet to his new home. Check out our shipping page for more details. Do you want that furry berner puppy but don’t have the finances at the time? We offer a finance option through Wags Lending, and you will only have to make the first of a 24 month payment to get the puppy. You can pay off the puppy in full at any time. Another option is if you want the puppy in your arms before you pay for it? With Wags Lending you will only pay for the first payment before the puppy is delivered. We would recommend Wags Lending if you are interested in a finance option or if you don’t feel comfortable paying for the puppy before you have him.